Jamie Lama joined Imagine Schools in May 2005 as a first grade teacher at Imagine Academy of Columbus. She served as a first grade teacher for several years prior to becoming a curriculum coach which led to becoming the School Principal. Jamie graduated from The Ohio State University with a Bachelor of Science in Education and a Master of Education. Her goals as a school leader is to promote a safe, academic environment where all students meet or exceed one year’s learning gain while developing a positive moral character. 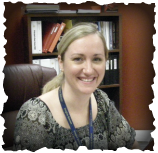 Emily Kerr is the assistant principal here at Imagine Academy at Sullivant. She began here in April 2009 and has taught 1st, 2nd, and 3rd grade throughout her years here. This will be her 4th year as the assistant principal. She attended The Ohio State University, where she received her Bachelor of Science and Master of Education Degrees in Early Childhood Education. She is originally from Lima, Ohio, but loves living here in Columbus! When she’s not at school she loves to spend time with her family and friends. She also enjoys playing sports and traveling. Her goal, as the assistant principal, is to help enrich the students’ minds while developing their character in a safe environment. She’s looking forward to a great year with the students, families, and staff here at Imagine Academy at Sullivant!